BARNUM AND BAILEY CIRCUS POSTER DETROIT vintage sign photo picture print for sale. 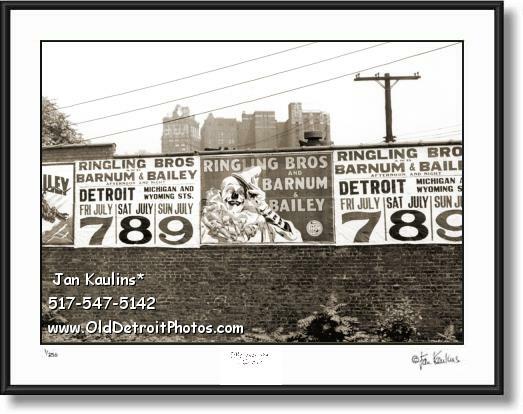 This Detroit RINGLING BROTHERS BARNUM & BAILEY CIRCUS photo picture print is a rare photo of one of the large advertising signs that were plastered on walls and fences in cities advertising where and when THE FAMOUS THREE RINGED RINGLING BROTHERS BARNUM & BAILEY CIRCUS was coming to town. The event was to take place at Michigan Avenue and Wyoming. Over the fence we can see the tops of some historic downtown Detroit skyscrapers. This sepia toned photo is made from a professionally restored original black and white negative/photo ca. 1940's. It is a very rare image and a wonderful collectible for a Detroit lover and a Circus lover.